Educate students on active transportation safety, including walking, biking and rolling. Make active transportation to school a safe, fun and appealing first choice. Encourage more students, including those with disabilities, to use active transportation to school, such as walking and biking, on a regular basis. Encourage parents to assist and participate. Facilitate the planning, development and implementation of projects and activities that will improve safety and increase walking, biking and other active transportation. Reduce traffic, fuel consumption and air pollution in the vicinity of the schools. Increase the prospect of academic success, i.e. students who are active and ready to learn. Gather interested community members – this can be other parents on your block or members of group you belong to. It might include community leaders or not. You don’t need to formally organize, a loose-knit group can lay the foundation. Early buy-in and participation from community leaders, such as school board members, superintendents, school principals, city leadership, or community groups is helpful but not necessary. This can come later after some success and fun. Start Moving – Community, neighborhood and school activities are a great way to get started at a small less formal scale. Listed below are some of the activities that others have used with success. Walk to School Day Planning: Walk to School Day held on the first Wednesday every October and Bike to School Day is held each May. These events are used to encourage families to celebrate the benefits of walking and biking and to introduce local leaders to walk and bike safety issues. These events can lead to changes in sidewalks, crosswalks and other local facilities as leaders who experience that environment first hand often have a clearer appreciation for the safety challenges. 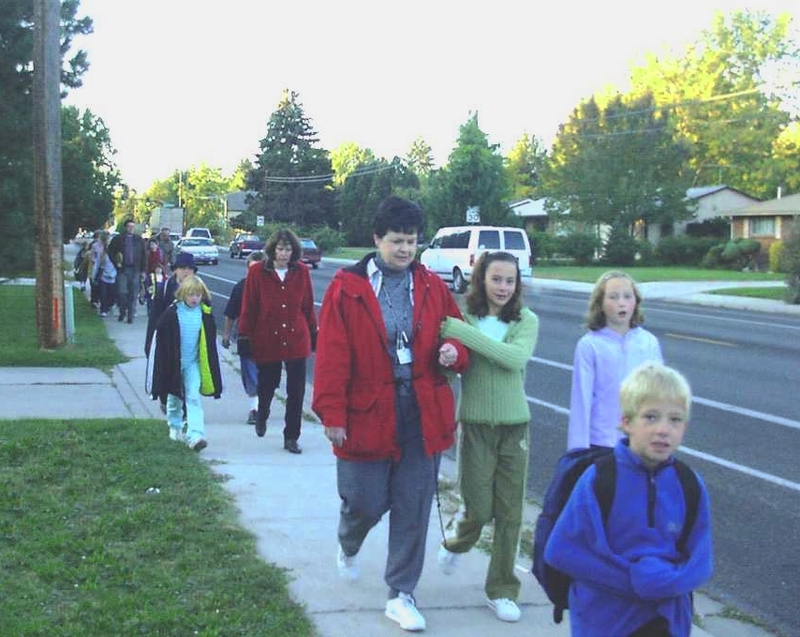 Check out ISG’s easy guide to Walk to School Day Planning. Walking School Bus: A walking school bus is a group of students and an adult or older student who walk together from neighborhoods to school. 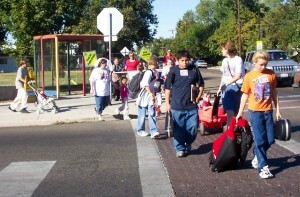 Student get exercise and learn safe walking behavior, safe crosswalk strategies and watch common driver behavior. 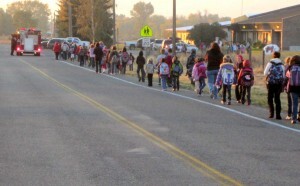 If done often it becomes accepted to walk to school in safety. Check out ISG’s easy guide to starting a Walking School Bus. Bike Train: Bike trains are similar to Walking School bus. Students ride in a train with and adult of older student who models proper bike etiquette and safety. Done regularly it is a great way for students to learn good biking habits. Bike Safety Rodeo: A bicycle rodeo is a clinic to teach children the skills and precautions to ride a bicycle safely. They provide an opportunity for bicyclists to practice and develop skills that will help them to become better bicyclists and avoid typical crashes and often include a safety clinic featuring bike safety inspections (and optionally quick tune-ups), and helmet giveaways and or helmet fit checks. Explore encouragement and education activities, and school site enforcement and logistical improvements and enhancements that can work toward you goals. Build partnerships to develop needs and plans for broader community infrastructure and enforcement upgrades and improvements. Look for volunteers to help with activities. Identify barriers to implementing the ideas gathered. 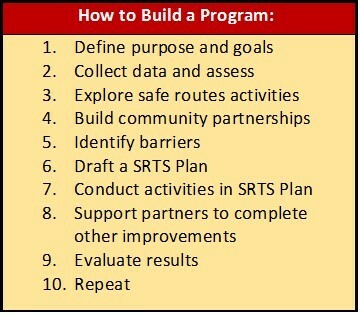 Draft a SRTS Plan including education, encouragement, enforcement and other improvements and strategies to overcome barriers in support of your school or community goals and that the school and school volunteers can complete. Design and Conduct the activities decided on for your Safe Routes to School plan. Check out these monthly fun fact sheets to get started. Work with community partners to plan for completion of infrastructure and other improvements that work toward your goals. Evaluate results by conducting surveys and analyzing available data such as safety indicators. Idaho Smart Growth has grant support from the Idaho Transportation Department through the Transportation Alternatives program to provide support and assistance to local communities in Idaho for Safe Routes to School Issues. Services we can offer are educational workshops, support to establish or build a local program, technical assistance to conduct assessment of local conditions and infrastructure.